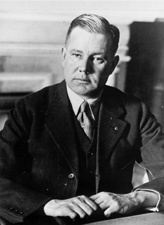 CUTTING, Bronson Murray, a Senator from New Mexico; born in Oakdale, Long Island, N.Y., June 23, 1888; attended the common schools and Groton (Mass.) School; graduated from Harvard University in 1910; becoming an invalid he moved to Santa Fe, N.Mex., in 1910 to restore his health; became a newspaper publisher in 1912 and published the Santa Fe New Mexican and El Nuevo Mexicano; served as president of the New Mexican Printing Co. 1912-1918, and of the Santa Fe New Mexican Publishing Corp. from 1920 until his death; during the First World War was commissioned captain and served as an assistant military attache of the American Embassy at London 1917-1918; regent of New Mexico Military Institute in 1920; served as chairman of the board of commissioners of the New Mexican State Penitentiary in 1925; appointed on December 29, 1927, as a Republican to the United States Senate to fill the vacancy caused by the death of Andrieus A. Jones and served from December 29, 1927, until December 6, 1928, when a duly elected successor qualified; was not a candidate for election to this vacancy; elected as a Republican on November 6,1928, to the United States Senate; reelected in 1934 and served from March 4, 1929, until his death in an airplane crash near Atlanta, Mo., on May 6, 1935; interment in Greenwood Cemetery, Brooklyn, N.Y.
American National Biography; Dictionary of American Biography; Pickens, William. Bronson Cutting vs. Dennis Chavez: Battle of the Patrones in New Mexico, 1934. New Mexico Historical Journal 46 (January 1971): 5-36; Lowitt, Richard. Bronson M. Cutting: Progressive Politician. Albuquerque: University of New Mexico Press, 1992.